After what I can genuinely only describe as a “hype roller coaster” surrounding what would or would not be revealed at BlizzCon for the Diablo franchise, we finally got our answer today. Diablo Immortal is this year’s major announcement for the franchise, and it’s a brand-new Diablo title… for mobile devices. Look, I’m not going to sugarcoat this — reactions to Immortal’s reveal haven’t been overly positive. However, I had a chance to sit in on an interview with developers from both the Blizzard team and the NetEase team, and outside of being enlightening, it also did a lot to fight off my lack of initial hype over the game. Not only does it seem like this will be a solid entry into the franchise worthy of being called a Diablo game, it’s also very apparent that this is a labor of love for these developers. With that in mind, let’s get to the interview itself. The big one on everyone’s mind: What is the pricing model for the game, and will it include microtransactions? Sorry, folks, they haven’t made a decision on what they want their business model to be yet. Right now, the focus for both companies is first and foremost on creating a Blizzard-quality Action-RPG experience. What about battery life? Will the game last for hours and hours and hours? Officially, they don’t have a specific target for off-battery length of play. They are, however, designing the game to be played in the multitude of ways mobile players tend to play. Specifically, some mobile players like to play in multiple short bursts, while others prefer to play for hours at a time. While the latter would very likely require being plugged in in order to last 5-6 hours, it’s still a playstyle they want to work if a player so chooses. 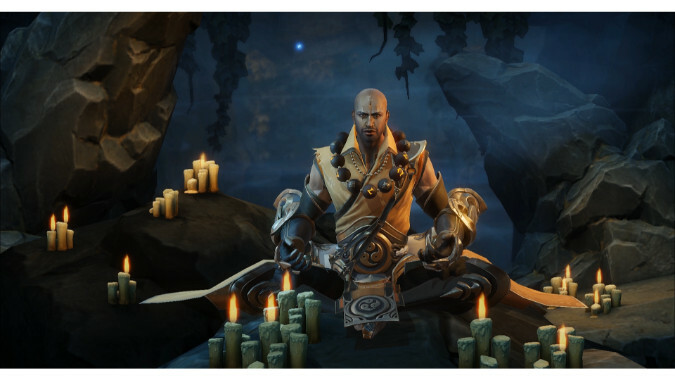 As far as the story goes, are we more likely to see a big story arc like we did with Diablo 3, or is it going to be more vignette-based? The game starts five years after the World Stone explodes at the end of Diablo 2, and the game takes place in the 20-year period between Diablo 2 and Diablo 3. That’s a lot of time. While we weren’t given a direct answer regarding if they’ll tie together, we were told that we can expect a lot of stories. They reiterate: 20 years is a lot of time. Regarding those stories, will they be told primarily via single-player content? Or will the game focus more on multi-player content? The game will be launching with 8 shared outdoor zones and 7 instanced dungeons, which are intended to be done as a group. While they repeatedly emphasized the game is a mobile MMO, they also said the main story would likely be told via solo content. They likened their content approach to World of Warcraft zones and how a dungeon will typically cap off a zone. Diablo 3 is known well for its procedurally-generated content. Will Diablo Immortal follow in a similar vein? They plan to “split the difference” when it comes to random content versus hand-crafted content, since the focus is on the game as an MMO experience. Outdoor zones are typically more structured, with variety coming in the form of monsters and quests. Meanwhile, instanced dungeons are a combination of hand-crafted and randomization. Speaking of the game as an MMO, how many characters will we be able to see on screen at once? This isn’t something they’ve decided on yet. Sorry! How will loot work in Diablo Immortal? Is it shared? Tradeable? Loot is per player — but they still want you to be excited to see another player out in the world. Did they have to make any sacrifices for mobile? How does it differ from the Diablo experience we’re used to? They don’t view any changes as sacrifices — rather, mobile offers different opportunities for different systems. One example they specifically pointed out was how phones allow you to move your character in one direction while aiming in an entirely different direction. This isn’t something that happens on console/PC Diablo games, and they’ve definitely designed some class skills around this concept. How much of the game design is being done by Blizzard? How much by NetEase? 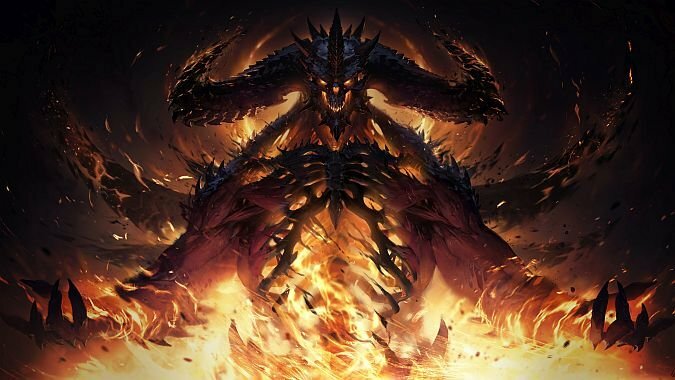 Blizzard knows how to make Diablo “Diablo” — they want this game to be top 10 in multiple regions, not just NA or just in eastern markets. The development is split evenly in a way that will appeal to players across the globe without sacrificing the Diablo experience. How did they deal with the pre-con hype and expectations from fans who wanted something other than a mobile title? They definitely tried to temper expectations with their blog post from a couple weeks back. They’re also fully aware that mobile games aren’t for everyone. Heck, even at Blizzard, there’s a fairly even split between mobile fans and non-mobile fans. But look back at previous announcements — new stuff like this is always met with skepticism and puzzlement. Hearthstone was the same way, several other games before and after it have been as well. Regardless, they’re trying to make a true Diablo experience, and they’re confident a large audience will absolutely love it! So does that mean they’re targeting a new audience with this one? How did they ultimately decide which classes — Barbarian, Monk, Wizard, Crusader, Demon Hunter, and Necromancer — would release when Diablo Immortal launches? First, they looked at the Diablo 2 and Diablo 3 classes for inspiration. They felt these 6 represent a wide variety of archetypes and playstyles that ultimately represent the Diablo franchise very well while still giving something to players of all types. That said, they want to continually expand the game — there are certainly going to be opportunities to add more classes over time. What were some of the biggest challenges in bringing Diablo to the mobile platform? The first one that came to several developers’ minds when this was asked was the control mechanic. The virtual joystick approach to movement is something that players in the east have adopted much more than players in the west. While this has changed slightly in recent months thanks for Fortnite mobile, it’s still a big challenge. Another challenge for them is in the memory. They want a high-fidelity game/experience, but they don’t want the download to ever become egregious. So how have the systems we know changed? How have they stayed the same? They want to keep systems players love (obviously). They also want to improve on systems that are working, but could be tweaked to be made better. That said, too many systems can be overwhelming. A mix of 1/3 existing, 1/3 improved, and 1/3 new is a pretty solid mix. Some existing systems will not make it into the final version, but they don’t have any specific examples right now. Okay, but what about the endgame systems then? Is it going to be really similar to Diablo 3? Endgame systems are still being worked out, but social systems are expected to play a part of them. (Again, they repeatedly emphasized that this is a mobile MMO.) They are really happy with how legendary items work in Diablo 3, so they expect to have that an important part of altering playstyles at high levels. They closed by saying that they’re experienced in making a game that players will want to keep playing — it’s just a matter of which/how many systems they decide to utilize in Diablo Immortal. How do they plan servers to work? Will this be a worldwide title? Region-based? How will connectivity work? They haven’t decided on this yet. Right now, gameplay is their top priority. It’s their only focus right now, and the regional plan is TBD. The game will have servers, but those servers and how they’re grouped is not yet determined. Both developers from Blizzard and developers from NetEase have a lot of experience creating MMOs, and they’re confident they can provide a consistent experience across the globe. Will the game ever come to other platforms? The Switch? PC? They have built this game from the ground-up to be for mobile. 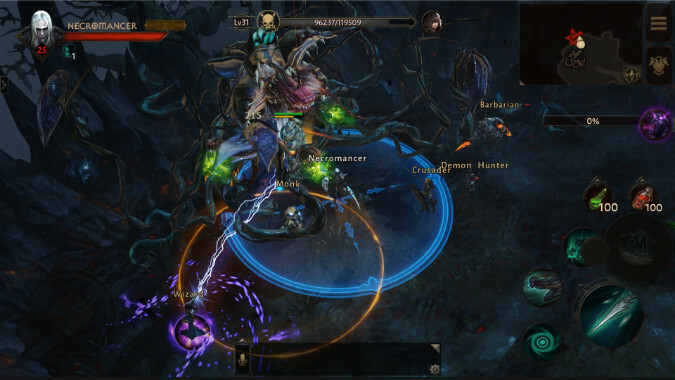 From a technological level, they want it to be distinct from Diablo 3. That said, they’re decidedly not explicit about future plans. They mention that “future games” in this space — presumably, other mobile titles — will probably have cross-platform play, with Hearthstone’s model specifically mentioned as a model for how that might look. To close, a couple miscellaneous points that were brought up: It might look like Diablo 3 when viewing on big screens, but it’s built on a newer generation of tech. On mobile devices, it looks fantastic and incredibly high-fidelity. In response to a question about it, they think it sounds cool to bring some ideas from Diablo 3 to mobile (but it’s not actually something they had brought up before now). And as a final reminder: This game is meant as an MMO. Guilds will play a big part in the community, and the game is meant as an online experience. That’s all we covered in the interview! It might be hard to put into writing, but the enthusiasm these developers clearly have for this game is infectious. We’ll have a review up shortly*, but for now, hopefully some of these answers have helped improve your outlook on the game. I know it certainly has mine. *Spoiler alert: We really like it, especially after getting a chance to try it ourselves.